The Dell Alienware 13 features a fantastic robust design with a 13-inch dazzling OLED display. While embracing today’s latest hardware, Dell has brought forth another gaming laptop with a small chassis, yet powerful laptop with an impressive 2560 by 1440 pixel panel. Dell Alienware 13 is offering a lot more than just the tear-inducing screen display to gaming enthusiasts. The Dell Alienware 13 offers an impressive brassy sound, fast-as-lighting transfer speeds and high-end graphic performance. The Dell Alienware 13 is a high-end gaming laptop, and for that, one should expect a robust design as well. The Dell Alienware 13 looks sci-fi smooth and beefy at the same time. The system is built into a well-carved segment made of silver anodised aluminium with a sturdy carbon-fibre frame. According to Dell, the material used is commonly used in aircraft construction. 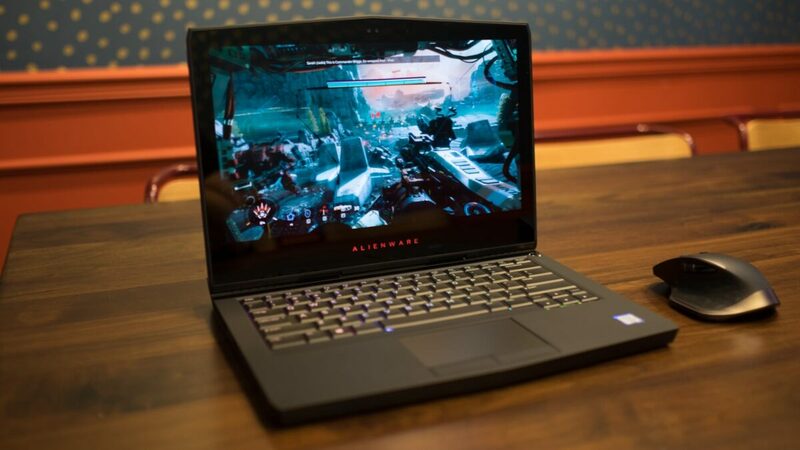 Alienware 13 looks Premium, and it surpasses most of other gaming notebook laptop. The keyboard has an intense and even illumination. It’s convenient typing on this gaming device with the help of the decent 13 x 13 millimeters key sizes present on the keyboard. Talking of the Alienware 13 screen, it has a world-beating screen. Dell happened to be the first company to Incorporate OLED display in its gaming laptop. The display features a 13.3- inch display with a resolution of 2560 x 1440 pixels HD. Colors on this panel are so vivid that you could almost paint with it. Dell Alienware 13 comes in 2 display variants – 1366 x 768 or 1920 x 1080 pixels . The configuration depends on your pocket and also the region. Also, jaw- dropping graphics display is certain with the NVIDIA GeForce GTX-10 Series GPU. It’s astonishing seeing Alienware 13 stuffed with a 7th gen. 2.5-GHz Intel Core i7-6500U processor, along with 8 gigabytes of RAM. Multitasking on the system is fluid that one can stream one the latest Episodes of Jenifa’s diary while running a computer scan and simultaneously running ten additional tabs on the Mozilla Firefox browser. The turbo boost utilization on the Alienware ware 13 also gives support to the overall performance of the device. However, it’s sad to know the gaming performance is bad with some games that require much more than the 15 watt CPU on Alienware 13. The Dell Alienware 13 comes out of the box, running the Windows 10 Home 64-bit operating system. It’s equipped with a sound system which is certified by an expert Audio. The laptop really barks well. On the right side of Alienware 13 device, there’s a USB 3.0 port, USB-C port and a gigabit Ethernet port. The Thunderbolt three port can also be found on the side of the device with speed up to 40 GB/s. Dell Alienware 13 is available, and its price starts from N350,000 in Nigeria. In the US, price starts around $999. Prices differ according to configurations and region.